Kotasek was nominated for the honor by the Jane Long Chapter of the National Society of the DAR, and her application and essay will now be considered for the national award. She will be recognized at the March 22 meeting of the group in Houston. Kotasek, a 2007 graduate of Clear Lake High School, was inspired to become a teacher by her mother, Laura Barker, also a social studies teacher at La Porte High School for the past 20 years. Kotasek’s grandmother was also a teacher, and she was further motivated by her history professors at Sam Houston State University “to keep the study alive in our society.” After graduating from SHSU in 2011, she began her master’s coursework, also in history, at the University of Houston Clear Lake. Kotasek taught at Manvel High School in Alvin ISD for a year-and-a-half before coming to La Porte, where she teaches Advanced Placement (AP) U.S. history to juniors. 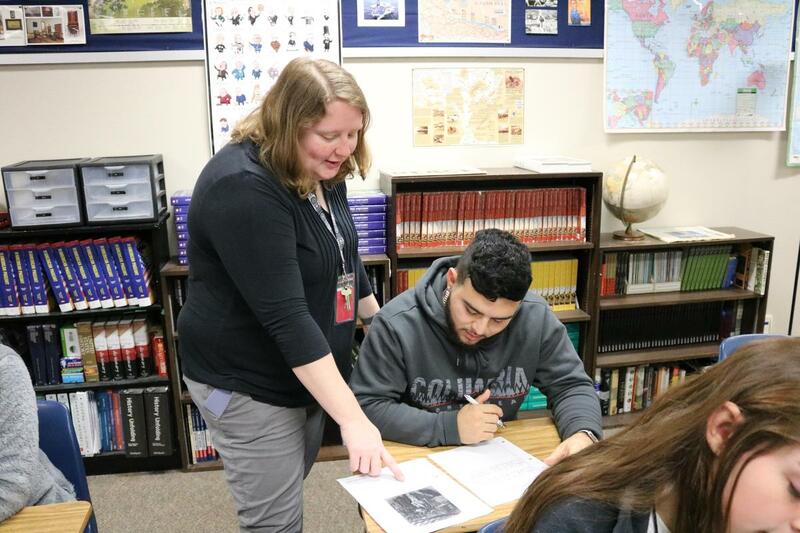 While teaching an AP class offers numerous challenges, such as training students to become proficient historical writers, she enjoys the benefit of being able to “dig deeper into history” with them. Students who pass the AP exam at the end of the year have the opportunity to receive college credit for two American history courses. Kotasek enjoys getting to know her students and tries to attend sporting events, theater performances and concerts as often as she can to understand the interests her students have outside of the classroom. In February 2016, Kotasek was responsible for La Porte High School being recognized as a Gilder Lehrman Affiliate School. She explained that the Gilder Lehrman Institute of American History is a premier organization dedicated to providing lesson ideas for middle and high school students and hosting online archives full of primary source documents for classroom use. In January 2017, she sponsored a student trip to Washington, D.C., to witness to Presidential Inauguration. Griffin added that Kotasek is continually comes up with new ideas and enriching activities that lead to high levels of engagement in her students. “No matter what I’m teaching, I try to find that spark that makes it interesting for my students,” Kotasek said. Away from the classroom, she enjoys being with family and friends, playing computer games, reading and playing with her dog, a corgi named Nugget. Kotasek also enjoys traveling; born in Salem, Massachusetts, she frequently visits the Boston area. She said that spending time on the Freedom Trail and visiting sites such as the Plimoth Plantation and the Witch Trial memorial have helped to enrich her lessons and allow her to connect with the material she teaches each year. This summer, she and mother embarked on a journey to visit sights in Berlin, Prague, Krakow and Warsaw. Visiting the prison and death camp at Auschwitz “had a profound and permanent impact on me,” Kotasek said. With this deeper understanding of the Holocaust and World War II, she hopes to communicate to students the importance of the tragedies the world has experienced in the hope that they remain vigilant against any mistreatment of human beings in their own lives. In her classroom, she uses innovative techniques to help students take the lead in their own learning. One project, dubbed “Revolutionary Speed Dating,” allows students to choose to research a notable figure during the Revolutionary War area. After completing the research, students dress in costume and bring props to exchange short speeches about their character’s significance to that period. Throughout the year, she also prepares them for seminars and debates, providing primary and secondary sources to analyze on a topic such as the annexation of the Philippines after the Spanish American War. Students then annotate the readings and prepare for a formal debate in class. By developing an outstanding rapport with students and passing on her excitement about her subject area to them, Kotasek not only prepares them for the exams they must take, but also for life. Photo: Sarah Kotasek assists junior Jordan Morales with a question.